In the sixties, the first semiotics was prisoner of the binary model of the sign and, consequently, was oblivious to the whole notion of meaning productivity. The generative-transformational theory, on the contrary, introduced the idea of productivity associated with the operation of language (under the form, among others, of Chomsky's "creativity" theme). In the 70s, the concept of "speech" opens the possibility of a conceptual development that is at odds with linguistics. A theory on social speech is necessarily located in a plane which is not language. In addition, this concept allows a conceptual reformulation, on one condition: to blow up the binary model of the sign and take charge of a "ternary thinking about meaning", buried under 50 years of structuralist linguistics. This project receives the name of “Discourse Theory or Social Discourse Theory”. The double operation - separation/articulation between discourse theory and linguistic on one hand and conceptual reformulation using "ternary thinking" on the other, will allow the discourse theory to recover forgotten problems: the materiality of meaning and the construction of the real in the semiotics network. Thus, this theory is inserted into a translinguistics tradition. The possibility of any analysis of meaning rests on the assumption that the production system leaves traces in products: "when analyzing products one aims to processes". a) All production of meaning is necessarily social: a signifier process cannot be described nor explained successfully without explaining its productive social conditions. b) Every social phenomenon is, at least in one of its constituent dimensions, a process on meaning production, whatever the level of analysis (about micro or macro sociological). Both components are of equal importance. It should be clarified that his double hypothesis is not claiming anything on the homogeneity of social performances: "if semiotics is operating condition of a society at all levels, this does not mean, however, that it manifests the same forms everywhere, nor that society as a whole has some kind of signifier unity". Verón says it is in semiosis where social reality is constructed. The smallest act - in - an individual's society assumes the implementation of a socialized cognitive framing, and a socialized structuring of drives. All meaning production has a material manifestation. This materiality of meaning defines the essential condition, the starting point of all empirical study on the production of meaning. We always start with configurations of meaning which are fragments of semiosis. Whatever the hardware, what we call speech or discursive whole is nothing more than a space-time configuration of meaning. The discourse analysis is nothing more than a description of the steps of productive conditions in speeches, whether they are those of its generation or those that realize their "effects". This analysis does not stop on discourse itself nor purely occupies itself on what's outside. The objects of interest to discourse analysis are not in the discourses, they are not outside of them, somewhere in the objective social reality. They are relation systems that all signifier product maintains with their production conditions on one hand, and their effects on the other. Both production conditions as signifier objects analyzed contain meaning, since between the productive conditions of a discourse, there are always other speeches. Discourses' relations, having production conditions on one hand, and recognition conditions on the other, must be able to represent themselves in a systematic way; we must take into account generation rules (production grammars) and reading rules (lecture grammars). These rules describe meaning assignment operations in significant matters which are reconstructed from brands - or significant properties with a non-specified relationship with productive conditions- present in significant matter. When the relationship between a significant property and its conditions are established, these brands become traces of either set of conditions. 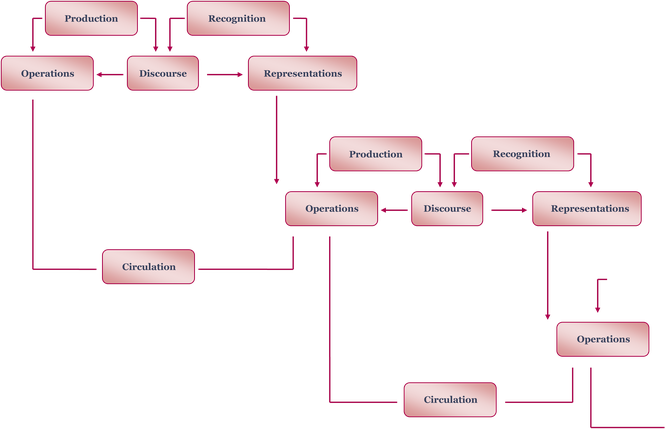 In this analysis we take into account the process of meaning circulation and the difference between production and recognition conditions. Grammars do not express text properties per se, but they try to represent text relations within a text or a set of texts with their productive system (their social system to allocate meaning). It shouldn't be inferred from this that there is a unique discourse analysis, au contraire, there are different type of analysis. One of the main goals of discourse analysis is to identify the variations associated with variations in productive conditions; to observe the differences from the discursive operation point of view; to describe these differences under the form of discursive operations; to reconstruct, finally, from this description, the rules pertaining to one or more grammars. A discourse can never be analyzed per se, because it has to be put in relation to certain productive conditions and because one must always compare discourses subjected to different productive conditions. Discourse analysis can only work on interdiscursive distances, it is always interdiscursive. If every meaning phenomenon refers to the productive system that accounts for their generation, their circulation and readings, then a speech, a significant package (whatever the significant matters at stake were) is never a place of meaning. It is, however, about giving us the means to find the process underlying the meaning, about rebuilding production through the contained brands located in the "states" that texts are. Semiosis can only take the form of a relationship network between the product and its production; it can only be pointed as a purely relational system: made of links between the discourse and its "other", between a text and what that text is not, between the manipulation of a significant set destined to discover the traces in operations, and the production conditions of such operations. Authors / References: Eliseo Verón.